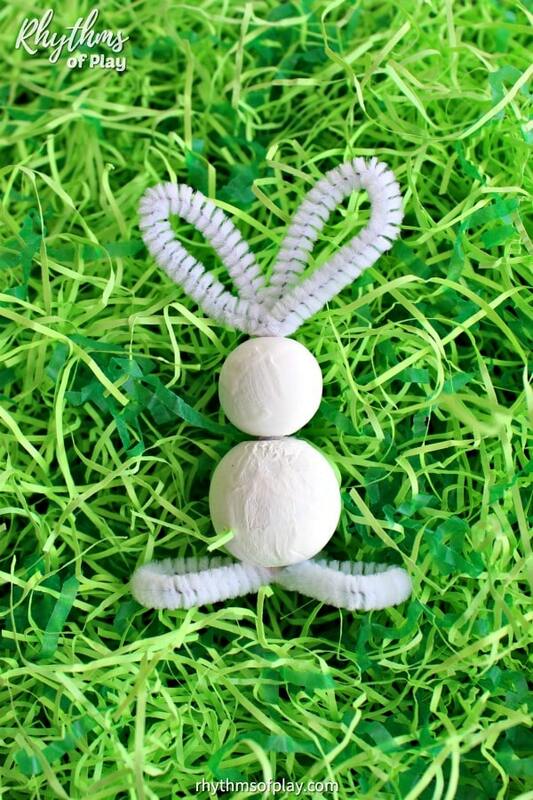 Kids love to make pipe cleaner crafts like this easy bunny craft made with pipe cleaners and wooden beads. Pipe cleaner Easter crafts like this cute bead bunny craft for kids and adults can be put together in a matter of minutes without glue. Learn how to make a pipe cleaner bunny craft with your children at home, or in the classroom, for Easter with our easy pipe cleaner bunny instructions! 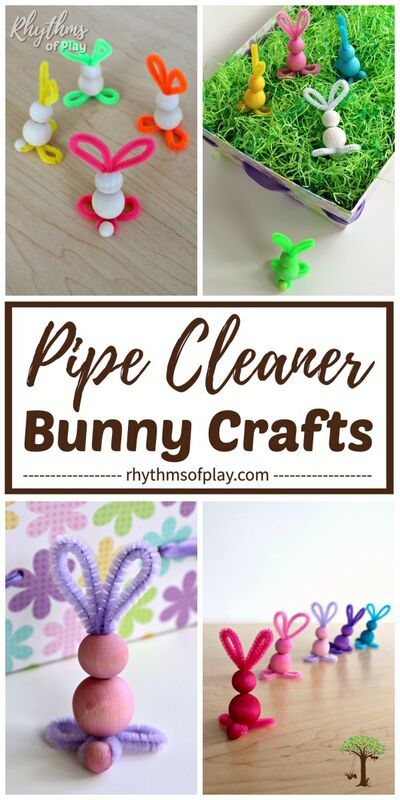 Pipe cleaner and bead bunnies, like these are easy bunny crafts for preschoolers and kids of all ages, are fun to make for Easter. 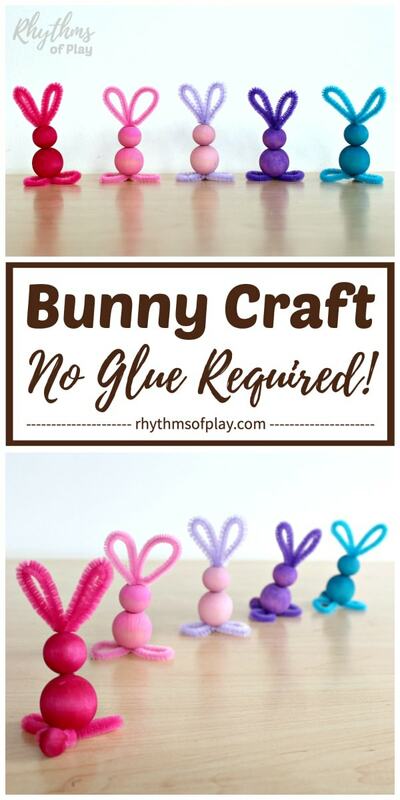 Bunny crafts made with pipe cleaners and wooden beads are so easy to make that you don’t even need glue! Of course, you can use a bit of glue to secure the bunny craft if you like, but you really don’t need it. 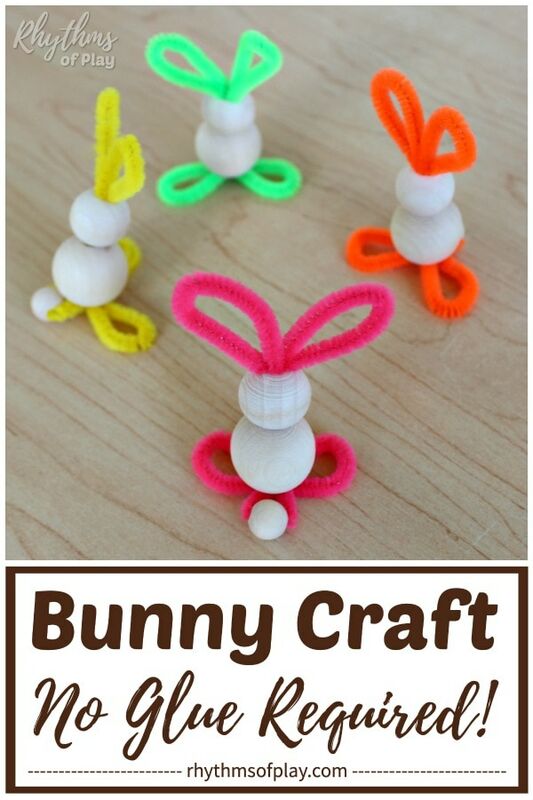 It is also optional to color the wooden beads before making this pipe cleaner bunny craft. These bead bunnies are absolutely adorable with both colored wooden beads and unfinished wooden beads . 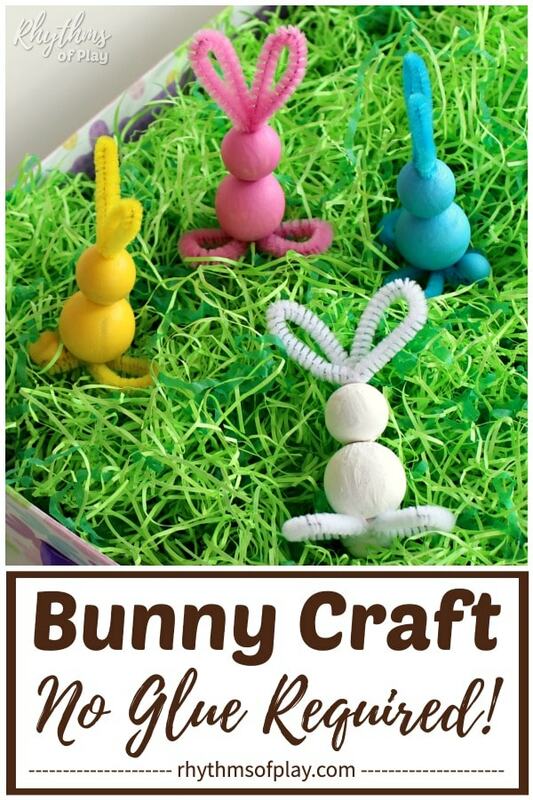 You can see all of our bunny craft photo examples below! This tutorial gives directions to make a pipe cleaner bunny craft with colored or unfinished wooden beads using a simple technique that my daughter and I invented–no glue required! Follow the simple step by step directions below to make this easy bunny craft for preschoolers and kids of all ages! Repeat as needed to make multiple wooden bead bunnies. If you would like to make colored wooden bead bunny crafts, hop over to learn how to color wooden beads using one of three different methods! 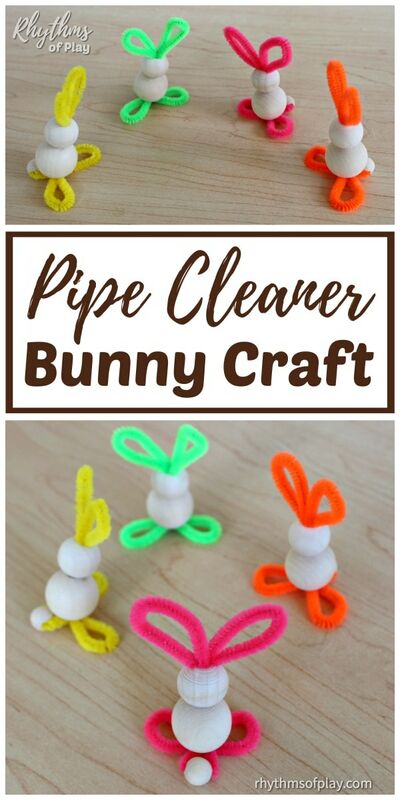 Pipe cleaner and bead bunnies like these make easy bunny crafts for preschoolers. A video tutorial showing each step in action can be found below the written pipe cleaner bunny instructions. Use a pair of craft scissors to cut two pipe cleaners into two 8 inch sections. Cut one of the remaining pipe cleaner scraps into a 2-inch section and set it aside to use in step 5. Fold both 8-inch sections of pipe cleaners or chenille stems in half. Join the folded sections of pipe cleaner by interlocking them at each fold so that the open ends of the folded pipe cleaners are facing away from each other. The bunny craft video tutorial below shows how this is done. Next, thread the folded and interlocked pipe cleaners through a 25mm wooden bead and a 20mm wooden bead so that the smaller 20mm wooden bead is on top. Make sure that the interlocked section where the two pipe cleaners meet is sitting inside of the top 20mm wooden bead. Again, if you would like to use colored wooden beads use our colored wooden bead tutorial. Thread a 12mm wooden bead onto the 2-inch section of pipe cleaner that you cut and set aside in step 1. Fold the 2-inch section of chenille stem in half around the wooden bead and thread it into the bottom of the 25mm wooden bead to make the bunny tail for your wooden bead bunny. You can see how this is done in the video tutorial below. Fold the pipe cleaners sticking out of the bottom bead and tuck them into the bottom of the bunny craft. Next, fold the pipe cleaner loops up and away from the bunny tail to make the pipe cleaner bunny feet. 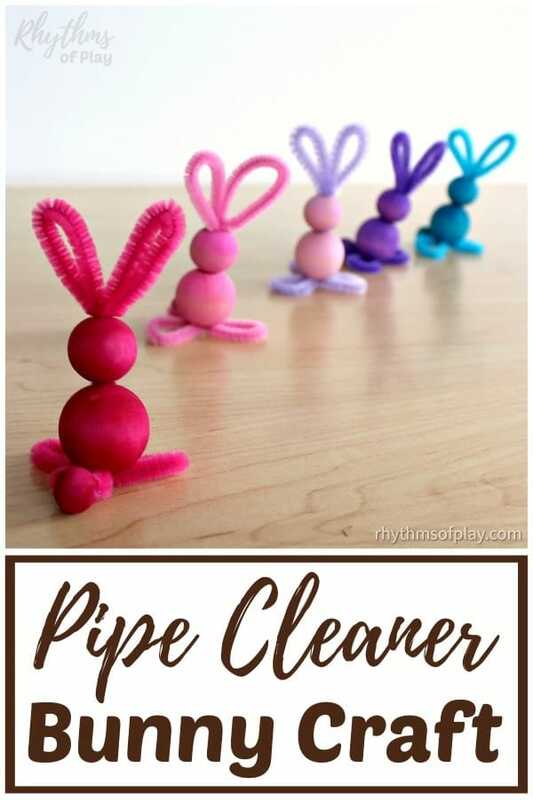 Secure the pipe cleaner bunny feet and bunny tail with a glue gun or white glue if desired. Adding glue to the bunny craft to make it more secure is optional, but not necessary. We did not use glue when we made our pipe cleaner bunnies and they are holding up great! Shape the pipe cleaners sticking out of the top 20mm wooden bead into bunny ears by folding each side down and tucking them into the top of the bunny craft. Secure the pipe cleaner bunny ears with a glue gun or white glue if desired. Again, gluing these bunny crafts to make them more secure is optional, but not necessary. My daughter and I had so much fun together figuring out how to make pipe cleaner bunnies with wooden beads. When we design crafts like this we call it craft engineering, and, find it to be a wonderful brain building STEAM activity for kids (and their caregivers). Once we came up with this technique, we decided to make lots of bead bunnies using different types of unfinished and colored wooden beads so you could see them all. We thought it would help make it easy for you to decide how YOU want to make this easy bunny craft. The pipe cleaner bunnies pictured below were made with unfinished wooden beads. Bead bunnies don’t get any easier than this! Using different kinds of colored wooden beads produces different gorgeous effects! We made pipe cleaner bunnies with dyed wooden beads and painted wooden beads. Check out the photo examples below! Pipe cleaner bunnies made with dyed wooden beads are also really quick and easy to make. Learn how to dye wooden beads with our easy tutorial, just click on the link! rn how to paint wooden beads with our tutorial, just click on the link! 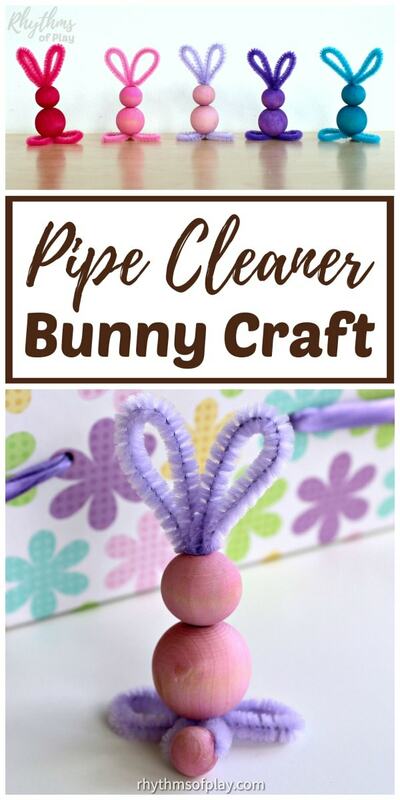 Learn how to make a wooden bead and pipe cleaner bunny with this easy tutorial. These easy bunny crafts for preschoolers and kids of all ages are fun to make for Easter. We hope you enjoy making pipe cleaner and wooden bead bunnies with your children at home or in the classroom. If you are wondering how bunnies and eggs came to be associated with Easter, hop over to read fun family Easter traditions. We have uncovered some fun facts to share with you! You may also like this collection of cute baby chick crafts and these fun Easter art projects for kids.